Athena had to hand it to Nebula, he knew how to make a girl blush. She went crimson and eagerly kissed him back, wrapping a wing sround his neck to pull him closer. She smiled as he told his story about being born in a nebula and watched him do his "special trick," eyes widening at the beauty of it all. "Oh wow.. Wow!" She grinned, looking st him with eyes as bright as stars. Her grin faded at his words and her eyes lost their sparkle. She stared at him, calculating and putting his sentence into meaning. Sh-t.
"Nebula.." Athena looked down. "When I was a hatchling, I lost everything. My unle betrayed me, and removed all love from my being. Atrex helped me rediscover that, and Im grateful to him but.." She looked at him. "You've made me feel so.. Alive. And.." She stammered and bit her lip, raising her eyed to his. "I know I'm not good at this! I'm scared to lose my reputation as a dragoness. I'm scared to be judged, not taken seriously because I have a mate and apparantly all females need to rely on their mates, I'm scared to.. To love," she then took a deep breath. "But I'd go through it all because.. Because I want to be with you, Nebula.. I know we can make this work.. A-and I.. I.. I.." She gulped, and then spoke. "I love you. So very very much." With his eyes going wide from her answer he gasped, kissing her again. After a while pulling away his voice was full of shock and excitement, "W..ha.a..Really?! I love you too...I always knew you where special" pulling her even closer he wrapped his wings around her in a hug. Smiling happily he licked her snout continuously, chuckling with a soft growl he replied "So.. you ready to head back?" tilting his head he was beaming with happiness as his scales could clearly show. Athena squeaked as he suddenly cut her off with s dazzling kiss. She floated there for a moment, before she growled possesively and wrapped her wings around him, pressing him close to her. She wrapped one wing around his neck to pull him closer, while she wrapped the other around his back to keep him close. Athena had seen other dragons kiss, rather grotesquely, in public, and this was how they did it. She hoped she was doing it right. Athena was both glad and sad when Nebula pulled away, glad because she needed oxegan and had forgotten she had a nose, and sad because it was.. Electrifying. She grinned at his words and hugged him back, giggling when he repeatedly licked her snout. "T-that tickles!" She squealed, back claws kicking. She then pouted playfully at his last words. "Aww, but this is a good place to be!" She leaned up to him. "Because no one can hear you begging for mercy," she whispered, smirking slyly. Chuckling with a smirk he replied "You mean yourself? Of course we can stay its just it can be dangerous if we linger for too long. Since well my Aura could wear off without me knowing or you could become more like me.. I don't really know.. its my first time using it properly" frowning slightly as he bit his lower lip, he gently used his paws to massage her scales feeling the embrace between them. "Plus.. I would end up tickling you more, The dragoness that loves tickles" he chuckled with a smirk playfully. Tightening the coil around their tails he replied "You know.. I love how cool your scales are, plus your hugs are amazing" sticking his tongue out he quickly kissed her chin. Athena smirked. "Didn't I tell you? Dangerous is my mid- hmmm.." She closed her eyes as he massaged her scales. "Nebula.. Stop it.." She groaned, flapping her wings gently at the electrifying sensation. "Before I.. Go crazy on you.." She purred, opening her eyes and looking at him as he spoke. She grinned at his complemeant and as he kissed her chin, she spoke. "Well.. I AM skilled in seduction." She french kissed his nose, purring in between. Smirking he blushed as she kissed him on the nose, licking her neck in response "Indeed you are..." chuckling he continued to massage moving along her feet and between her toes. Giving off a soft growl closing his eyes nuzzling her snout relaxing against her. Giving her a quick lick against her cheek, wondering what to do next. As Nebula massaged her feet, Athena lost it. She attacked him with an aggressive kidd, snarling from possessive need. 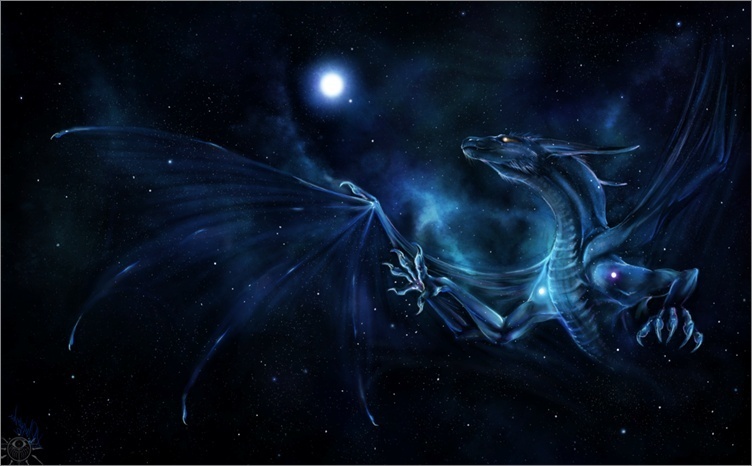 She hooked her wings around his sided and practically squished them together, using her bladed tail to carress his shoulder blade and along his neck. Her eyes were glowing very softly, but it was eerily bright all the same. "I have a few ideas of what we could do.." She whispered into where his ears were, nibbling his scales. "Something.. fun." Then she pulled back and smiled like nothing had happened. "Let's get back to Earth," she grinned, back legs kicking from the massage. "So we can go somewhere where nobody can hear us," she purred, flirting with him eagerly. Whelping as she suddenly changed moving her tail against his shoulder, "Err... err... okay..." looking a little worried he realized what she meant, chuckling he pressed his nose against her cheek again. "Alright.. where would you like to go?" raising a brow as they wern't limited for choices on the planet. A soft growl rumbling in his chest, as he pulled her along heading back the planet from they began. Athena burst, to her own surprise, into a fit of giggles at his priceless reaction. "Oh god, Nebula, I'm joking," she chuckled, nuzzling the side of his fsce a she pressed his nose against her cheek. She slowly wrapped her wings around him, claws entangling with his in a loving embrace. So many thoughts, so many emotions, were going through that big brain of hers. She laughed as they started moving again. She outstretched one wing and slowly loosened her grip on his claws. Now hanging on by just one wing, she slowly outstretched her once-broken wing. She grinned, feeling brave, and moved her wing along his so she was hanging on by a tip. She looked around, at all of the stars, the emptiness, and then she smiled. Athena: hmm.. No, not really. Athena: whatever. Lets go to the thread! xD Im eager to see how Nebula and Athena act together in front of s group.